This article is Copyright 2002 to "Serve It Forth!". All rights reserved. The author retains all publication rights. Crossposting of this article without specific permission is prohibited. This article can be printed for personal use. You cannot edit, abridge, or change the article in any way from the text presented here. Serve It Forth!, October 2002. One copy will be kept on file at Serve It Forth! and the other will be forwarded on to the author. David Friedman is a professor of law at Santa Clara University. As Duke Cariadoc of the Bow he is one of the original publishers of A Collection of Medieval and Renaissance Cookbooks. If you don't have this, you really should! He can be contacted by e-mail at ddfr@best.com. Mary Savelli, Tastes of Anglo-Saxon England, Anglo-Saxon Books, 2002. Inform the autocrat that you cannot do a period Anglo-Saxon feast because the recipes do not exist; if he wants a feast labeled "Anglo-Saxon" he will have to find another cook. Design a feast using ethnic cuisine from the appropriate area--this may work better if we substitute "Viking" or "12th Century Russian" for "Anglo-Saxon"--while avoiding, so far as possible, blatantly out of period ingredients. Design a feast using period recipes from other times and places that you can argue might have been used in the time and place of the feast. Try to reconstruct the desired cuisine from sources other than cookbooks. Solution 4 is the most difficult and the most interesting. In this book, Mary Savelli has tried to do it, taking advantage of Anne Hagen's two detailed handbooks of Anglo-Saxon food and a variety of other sources. It is a courageous attempt, but not a very successful one. Consider the first four recipes. After a page about bread baking, demonstrating that bread was indeed baked by Anglo-Saxons and others, the author then presents a recipe grandly titled "�tena Hlaf (Oat Bread)." It is a conventional modern recipe for oatmeal bread, using rolled oats--a nineteenth century invention. It is followed by a modern recipe for rye bread. That is followed by a recipe for a cheese spread, apparently of the author's invention; I discuss below its claim to have some connection with a period medicinal recipe. The fourth recipe is for honey butter. The author tells us that it "was a popular spread throughout the middle ages" but provides no documentation for that claim, presumably because none exists. While there is a mention of honey butter as a medicinal in Anthimus, diligent searching by SCA cooking enthusiasts has so far failed to produce any evidence that it was used as a spread in the middle ages, let alone that it was "a popular spread throughout the middle ages." 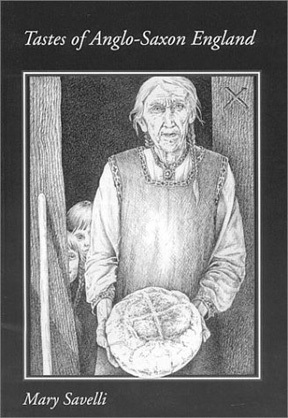 The author describes many of her recipes as to some degree derived from surviving medicinal recipes--which, unlike culinary recipes, survive from Anglo Saxon England in considerable numbers. The procedure has some inherent problems; it is hard to see how, even with the best of intentions, one can deduce the spicing of a sweet bread from the ingredients of a salve or the composition of meat stuffing from instructions for making a poultice--both of which she does. A further problem is that she does not include, or even quote, the medicinal recipes she is working from. She does, however, cite her sources, and I was able to locate a copy of one of them. Comparing its contents with her recipes reinforced my long held belief that one ought never to rely on a recipe from a secondary source that is not accompanied by the primary source version. In a number of cases, her medicinal recipes not only are irrelevant, they do not say what she says they do, at least in the translation included in her cited source. Consider the "medical recipe calling for dry bread and cheese to be boiled in rose water," on which she bases her cheese spread. The relevant passage reads: "At whiles roast the cheese and dry bread, and let him drink water which has been sodden upon roses, ..." Water boiled with roses is not rose water, since it has not been distilled, and the bread and cheese are not being boiled in it but roasted and fed to the same patient who drinks the water. Or consider the statement in her recipe for apple butter that "a recipe for stewed crabapples suggested this particular combination of spices." In the original recipe--a cure for vomiting--only the water the apples and mint are boiled in goes into the patient. The crab apples themselves are applied externally. Work thus a brewit for lung disease; take betony, and marrubium, wormwood, hind heal, the lower part of wen wort, lupin, helenium, radish, everthroat, fieldmore; pound all thoroughly well, and boil in butter, and wring through a cloth; shed on the decoction barley meal, shake it in a dish without fire till it be as thick as brewit; let him eat three pieces, with the drink of the warm liquor. The barley in the original is ground but not cooked; the barley in the soup is not ground and is cooked. All of the herbs in the original are pounded; none of the herbs in the soup is. The only connection between the two recipes is that they have two or three ingredients in common. There are other problems. The author tells us that "The vegetable marrow and cucumber were two summer squashes that grew in Anglo-Saxon England." The cucumber is not a summer squash and summer squash (varieties of Cucurbita pepo) is a New World vegetable. Elsewhere she uses (New World) kidney beans and gives tea as a possible ingredient in mead, both times without any warning to the reader. She asserts that "Apicius was used throughout the Middle Ages," a proposition for which she offers--and I know of--no evidence. In these and other ways she signals her lack of the level of background knowledge, historical and culinary, necessary for the difficult project she has undertaken. Anyone who thinks that cloves and cinnamon "have similar flavors to" bayberries and mastic (p. 39) has never tasted mastic. Subtler difficulties mark her Anglo-Saxon cuisine as the creation of a modern cook. Consider pepper. It is clear from Ann Hagen's discussion that it was the most common of the imported spices, but also that imported spices were rare and expensive. If we eliminate breads and drinks, pepper appears in almost precisely two thirds of Savelli's recipes, including recipes based on the food of the common people. After mentioning that barley has little of the gluten needed for bread to rise and that barley bread was generally used by penitents and the poor, Savelli suggests that if the reader wants to try "this type of bread" he should substitute barley for oatmeal in her recipe for oat bread. Doing that gives a recipe with more than six times as much wheat flour as barley flour--not a plausible reconstruction of the bread of people who used barley because they could not afford wheat. Savelli's oat bread is a raised loaf made mostly out of wheat flour, although the one explicit reference to oat bread in Hagen's books suggests that it was unleavened--oats, like barley, lacking adequate gluten. In these cases, as with most of the book's recipes, the only connection to Anglo-Saxon England is the Anglo-Saxon name attached to the recipe. I hope this book will provide an inspiration to someone, possibly its author, to go back and do the job better--try to figure out what an Anglo-Saxon loaf of wheat bread, or oat bread, or rye bread, or pea bread was actually like, how Anglo-Saxon mead was prepared--I guarantee that tea was not an ingredient--and much else. The table at the back of the book, listing ingredients and source documents that refer to them, would be a useful aid in that project, as would the author's bibliography. I am afraid, however, that the book's chief use may turn out to be as "documentation" for people more interested in being able to claim to produce an Anglo-Saxon feast than in actually doing it. If so, one unfortunate result of Ms. Savelli's well intentioned efforts will be to decrease public knowledge of early cooking by spreading false information--about oatmeal, bread, honey butter, summer squash, and much else.